After all the fun I had with my plaster roses I had just a little bit of plaster left in the tub and I decided to let it not go to waste and find another creative use for it. 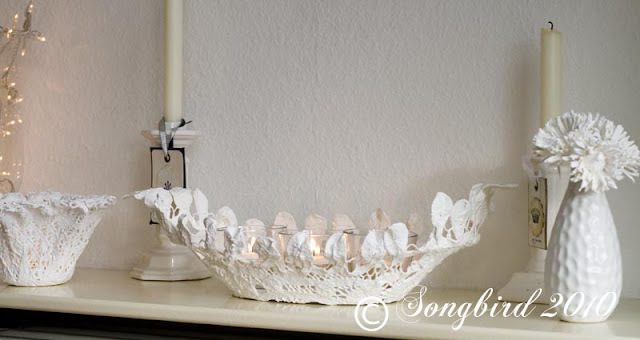 An old vintage crochet doily turned into a candle holder with some plaster. Don’t you think this looks lovely? It looks even better at night when you can see the candle light shine through all the little holes. Want to make one too? Ok then, here is a tutorial for you. First look for a nice (old) doily, whose shape might make a nice ‘basket’. For this tutorial I choose a bit rectangular shape, because I thought it might be interesting. This doily had been stiffened before, but I just rinsed it in some water and it was fine to use. Mix up your plaster. Again add just enough water to give it the consistency of yoghurt rather than milk. And then soak the doily. When it is thoroughly soaked drape it over a form. I used a bowl from my mother’s Sunday China, because I knew it would be fine. As you can see I filled up the bottom with some extra plaster, this way you will have a proper bottom in your bowl. Here you can see that better. This doily fit right over my bowl. For the little project I showed on top, the cup was smaller than the doily so I draped it with pleats. Remember everywhere where the inside of your doily touches a surface it will be probably dry up flat (the crochet texture will not be visible). So if you want the crochet look on the inside too, use as many pleats as you can or let you doily hang loose. Then pry it loose, again have patience. First start to loosen the edges of the doily from you form carefully. Then turn it around and wiggle with the form. You will panic here! But just be patient, have faith in me and keep fiddling with it carefully and then at the exact moment when you think you will have to ruin your project or you will have to break your precious China, magically it will come loose. At this time you can make some tiny adjustments (open up some holes that have filled up and remove some excess drippings) and when it feels right, put your sculpture down and let it dry completely. And then you have a bowl you can fill up with anything you like. I used some twig and feather balls, but I think green apples, Easter eggs or chocolates would look great too. The plaster might shed a little, but a light coat of white spray paint will seal it nicely. I think it looks like a sculpture! And then make a few and start vignetting. Have fun! And I would love it if you let me know if you have started to turn your old doilies into lanterns and bowls. Marianne! Those doilies are beautiful! Thanks for sharing. btw, If you would like for me to send you my next pottery barn catalogue in the mail for you to peruse, I'd be happy to. Just let me know. that's real smart, maybe i gonna make one myself. but i think i need to make a doilie first. What a great idea Marianne – I love it. They both look so beautiful in your displayes. that is awesome! I love the candle inside! so pretty! thanks for sharing. What a great idea. I love the look. Still looking for the plaster. I need to get to a bigger town. This is brilliant, Marianne. I love it. I don't know if I have the patience for it but I applaud you. It does look pretty with the candle glowing inside! Dat wil ik ook altijd nog eens doen, maar het komt er maar niet van. Een lapje in de stijfsel en moet je zien hoe leuk dat wordt. Mooie foto`s vooral die met dat licht erbij, heel mooi! Wat mooi zeg! Jij bent ook zo slim! mooie tutorial. Marianne, that is SO cute…SO clever…and makes such a pretty little statement…i love it!!! That is so darn darling! Very pretty! And I'm thinking that if you cover your form with plastic wrap first you won't have to worry about breaking it. Seems like we used to do that with styrofoam forms. I KNEW IT COULD BE DONE!! Thank-you for proving it to me. I've had that idea in my crazy mixed up head for some time. But never tried it. I've seen the porcelian stuff on the market to do flowers. And always wondered if you could do doily's with it. And you have shown me that good old plaster could do it. Have you seen Maggie Weldon's site. She has a beautiful line of what I call doily bowls. What a great idea! I love this! Thanks for the directions! I've been working on this same kind of project! I've only used round ones but the battenburg lace looks awesome! Beautiful job! What a fantastic idea that is, I love it! What a brilliant idea! They are so beautiful! What a fantastic and practical way of showing off doilies which are otherwise hidden away in drawers. You are so inventive to come up with that. Great! They add an unexpected feminine touch! So creative!! Those are gorgeous – you sure know how to make the best of plaster. I loved the barcelona post also- the lettered mural is amazing. Thanks for sharing it and always finding time to stop by my blog. Oh I love this idea! I have a few old doilies that have gotten stained from spills and candles, I see a new life for them in sight. Thank you, Thank you, thank you for this great use for them. That is the coolest thing I have ever seen! Amazing!! My sis did this with starch years and years ago, but I'd never have thought of using plaster. Way cool! i have two vintage doilies sitting in storage, made by great grandmother. now i have a project for them. thank you! Oh my gosh!!!! This is another lovely project! (I am personally crowning you the Queen of Plaster!!!) Must try this!!! This is amazing! love it! coming over from todays creative blog! I featured your potter barn number planters on my Frugalicious Friday favorites post! Thanks for linkin' up…I love your doilies!! I can't believe one person can be so creative and talented! This is such a cool idea. I love it. Thanks for sharing! I want to try this with some doilies my grandma made. Stopping by from Today's Creative! Just signed up to follow you. Stop by my scrapbooking blog when you get a chance http://juliechats.blogspot.com I'm always looking for a few more crafty followers! SUPER cool!!! I will be trying this soon.thks for sharing. so pretty! I can't wait to try this!! thanks! Marianne – you never cease to amaze and delight! I'm posting about this on my blog! You certainly are into white these days – and I adore what you are doing with it. BTW, love your 2-col layout. Je bent zo grote talent,my hemel!!! You are wonderful,wonderful creative bird!!! Absolutely gorgeous, thanks for the tutorial…. Great project! How about spraying the item you use as a form with non-stick cooking spray, or rubbing just a little oil on it to prevent sticking? I absolutely love these and the roses! I can see I am going to be visiting for a long time, because I am so fascinated! (By the way, is the "plaster", plaster of paris? In the meanwhile, I think I will make some more coffee and continue for a while. I love your project I have been looking for doilies for months in Charity shops etc can't find any any where :0( but when I do i may well give this a go! This is my first visit. I found you via Susie at 1st Floor Flat. She linked to your tutorial. These are so pretty and the skies the limit…now I do have a question..How easily does the plaster come off of the mold you've used? Does it wash off with warm water? Drop by when you have a moment..
Great idea, it remembers me on what my mum and grandmother did in earlier years. They did the same with very strong sugarwater and got the same results even a bit more in the details, because you can't see any plaster. Oh my goodness….how clever is that? I have a hunch you'll be seeing them all over bloggville now! Not sure what kind of plaster to use? Is that just plain old plaster of paris? Marianne. OMG those are beautiful. I love the candle one. What a simple idea. How creative is that! Adorable!! Love it! Great idea and the white would be great in my dining room. Now, I just have to search out a doily! Omygoodness…how clever you are! I love the doilies and plaster! Yep. This did it. You're officially going into my blog roll. Very creative! This is such a cool creative idea. I can't wait to start dipping some things! I love pinecones and would love to see how that turns out. I really want to try coloring the plaster as well! Thanks for the inspiration. …hmmmm, do you think the plaster would take some spray paint? I just picked up some old doilies at the antique mall…HAVE to try this!! I am off to a second hand shop tomorrow to look for old doilies. Thanks for sharing! I might even try this with some colourful scarves! Thank you! I can't wait to try this! And I just happen to have a new carton of plaster in my studio! Yay! Finally! Thank you for this terrific idea! I have quite a few family heirloom doilies and now I finally know what to do with them! You are a genious!!! Wow, a genius, I haven’t had that compliment much. Good luck and have fun playing with plaster and doilies.